Boasting a feminine combination of rhodium plating and clear stones, this simple yet highly elegant pendant will inject a touch of colour into any look. 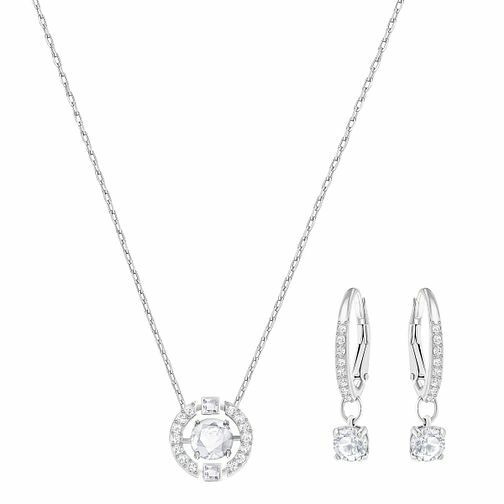 With matching drop earrings. Swarovski Sparkling Dance Round Necklace and Earring Set is rated 5.0 out of 5 by 2. Rated 5 out of 5 by Anonymous from Very eligent and goes well with a variety of clothing Nice well presented romantic birthday present and a affordable price! My girlfriend looks fabulous wearing this set and the best part of it is that she can wear it with most of her clothing so she can feel special everyday no matter what she’s wearing.